The Fascist Architecture is a functional style, developed above all in Rome, during the fascist dictatorship, with the aim of conciliate the tradition of the ancient Rome with the modern architecture. 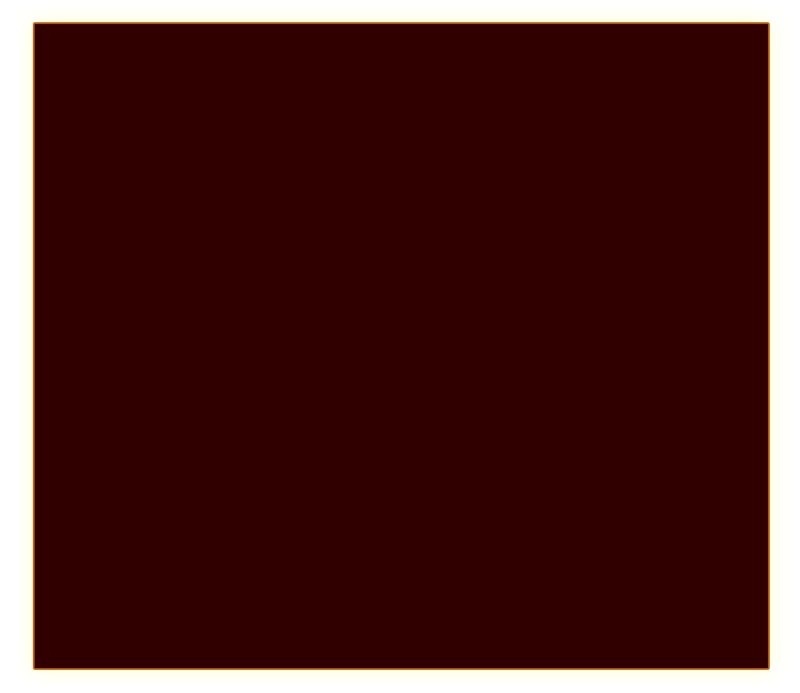 The Fascist dictatorship set up in Italy after the end of World War I (1922-1926). Italy, although it was victorious, went through a great economical and social crisis, the discontent and the protest of workers resulted in many strikes, and Benito Mussolini profited by this situation and rose to power, with the help of King Victor Emmanuel III. 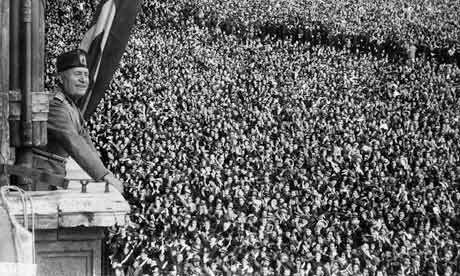 With the march on Rome in 1922 Mussolini marked his relationship with the capital city, associated it with the fascist ideology, influenced by the Roman Empire. 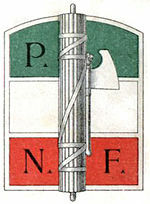 The same symbols used by Fascism show it, the “fascio littorio” (in the ancient Rome it was the symbol of the judges) which was a bundle of sticks of wood, joined with strips of leather around an axe. 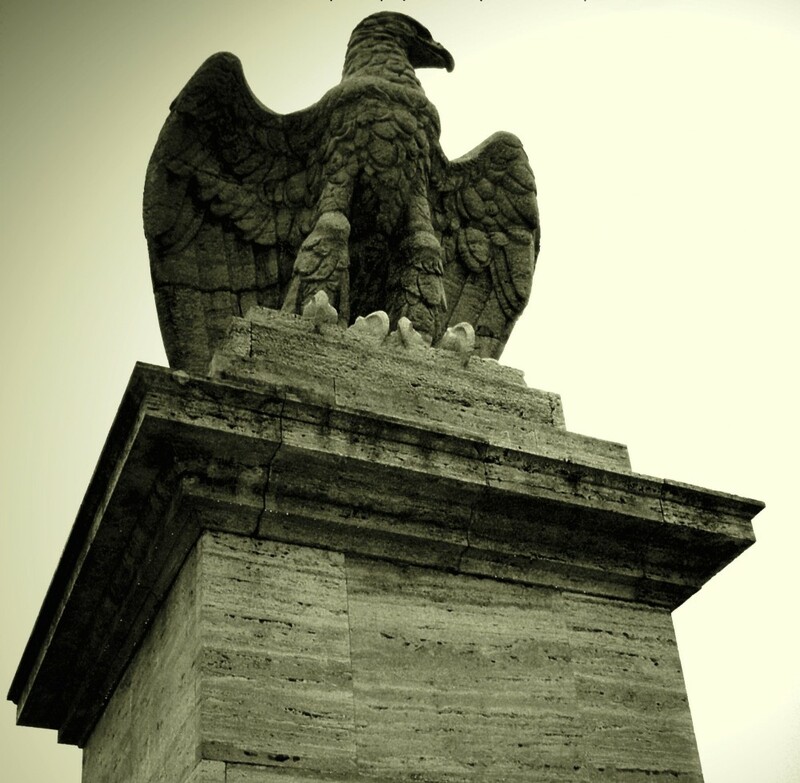 They were shown during the public ceremonies, by officers who were called “littori”, the symbol used by Mussolini and many buildings in Rome were decorated with them, or the Eagle with unfolded wings, which was in the ancient Rome the symbol of the greatness of the empire and the victories, and the same fascist salute, was the traditional salute in the Ancient Rome. Mussolini took up residence in Rome at Villa Torlonia (from 1923 to 1943), and chose a balcony of Palazzo Venezia to deliver his speeches to the people. 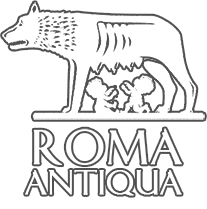 The relation between Rome and Fascism was very strong, in 1924 Mussolini nominated “the Birth of Rome” the Fascist holiday, proclaimed on 21 April (it was called by Romans “Dies Romana”), in relation to the legend narrated by Marcus Terentius Varro (Roman writer and soldier), in which Romulus founded Rome on 21 April 753 B.C.. Many monuments and buildings of Rome were built during the 20 years of Fascism, the “Foro Italico”, inaugurated in 1932 as “Foro Mussolini, Eur district, among which we can mention the Palazzo dei Congressi (work by Adalberto Libera of 1938), Palazzo degli Uffici and the Palazzi della Civiltà e del Lavoro, but also some districts such as Garbatella and Rione Monti were influenced by the fascist architecture. This style is different from the other styles of the other dictatorship of that time, such as Nazi and communist, for the use of travertine, bricks and marble, and for the addition of some statues, bas-reliefs and mosaics, which referred to the glory of the ancient Roman spirit. 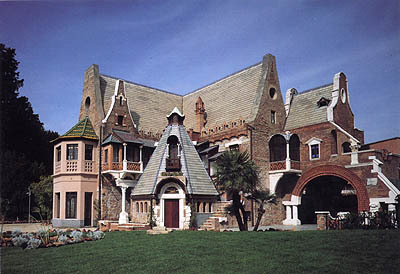 The architecture was also a portrait of politics and with a propagandistic feature. Sometimes this was planned in a bad way, such as the building of via dei Fori Imperiali which caused the destruction of most of the fabric of the city. Other monuments of that time are the building of the Post at via Marmorata, or the Complesso del Dopolavoro at via di Porta Portese, on the side faces of the Stazione Termini, and at via della Conciliazione, work by Marcello Piacentini and by Spaccarelli of 1938-1950, and even in a church, San Pietro e Paolo at Eur by Arnaldo Foschini, with Greek-cross plan, overlooked by a great Renaissance dome. Foro Italico includes the Palazzo H (now called the Palazzo CONI), the Stadio Olimpico (with a capacity of about 100,000 people) and the Stadio dei Marmi. It was built upon request of Mussolini and carried out during the Fascist period according to a project called Città dello Sport (City of Sport). 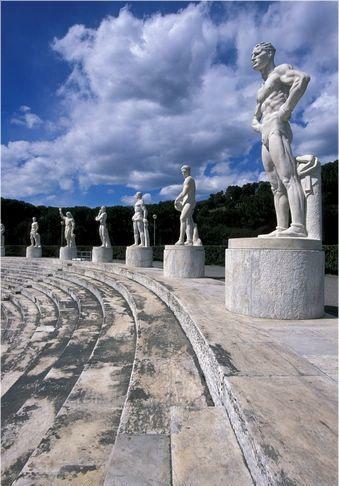 The Stadio dei Marmi, entirely made of Carrara marbles, shows a unique beauty: it is able to host 16,000 people and is encircled by 62 statues of athletes in different postures. 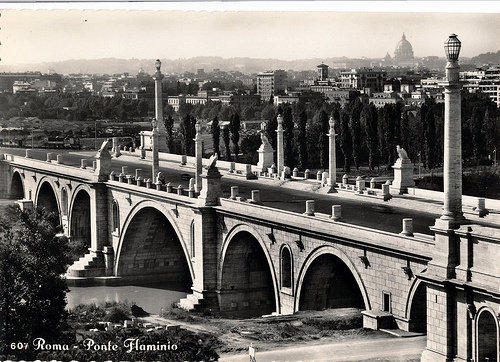 The bridge was designed to leave the city easily, in the direction of the Via Cassia and the Via Flaminia, during the first 30 years of the 20th century, but for Fascism, it was a scenographical entry for people coming from the north of Rome. It was obvious, the fascist rhetoric in that period was at the peak, at first it was called "XXVIII October" in memory of the march on Rome of 1922. The bridge, 292 m. long and 40 m. large, has 5 arches, the central arch 52 metres long, and the 4 side arches 25 metres long. Made of concrete, with a coating of white travertine, shows four eagles and four streetlights on the central arch, which make the complex very charming. It was designed by Armando Brasini, and built by Aristide Giannelli, but Mussolini modified the initial project, he eliminated the great arch built at first, the chief often changed the monumental projects of Rome. The works started in 1938, on the eve of the second world war, suspended in 1943, when some structures were damaged for the wars, resumed in 1947 and concluded in 1951.